Large Antlers may be dropped by male deer and elk, whereas female elk drop small antlers. 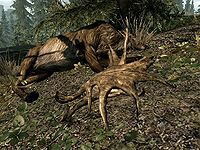 There is a 50% chance that any male deer, elk, or the White Stag will drop large antlers, in addition to venison and deer hide. This page was last modified on 9 April 2018, at 05:12.